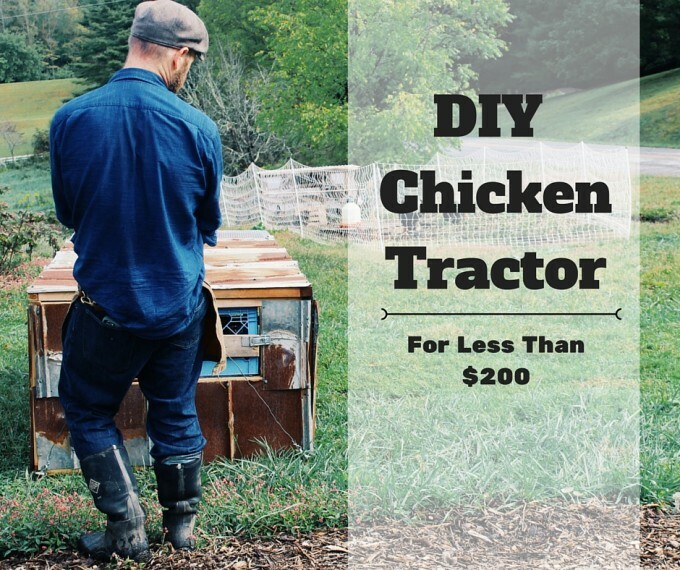 A DIY Chicken tractor that makes sense (and it costs less than $200). “For reals” man, I can’t believe this. 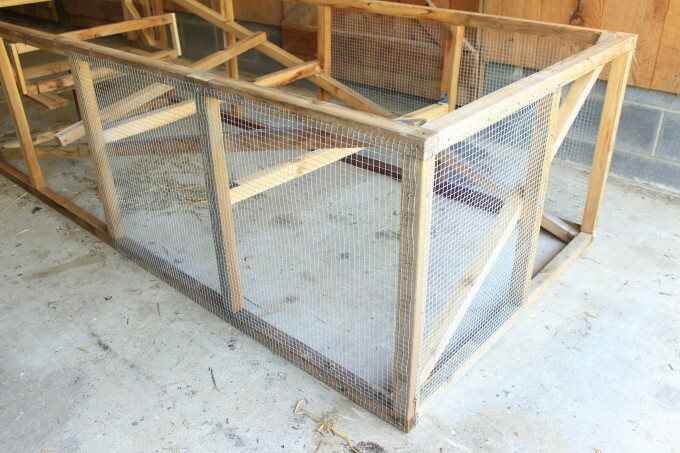 I just built an extremely functional, DIY chicken tractor for less than $200 ($193 to be exact). Granted, I re-purposed the tin and the milk crates and I had the screws. But come on people, I built this with Cedar 2X4’s (expensive). You could go un-treated and save $60! For a complete breakdown of the price and downloadable step by step instruction, CLICK HERE. 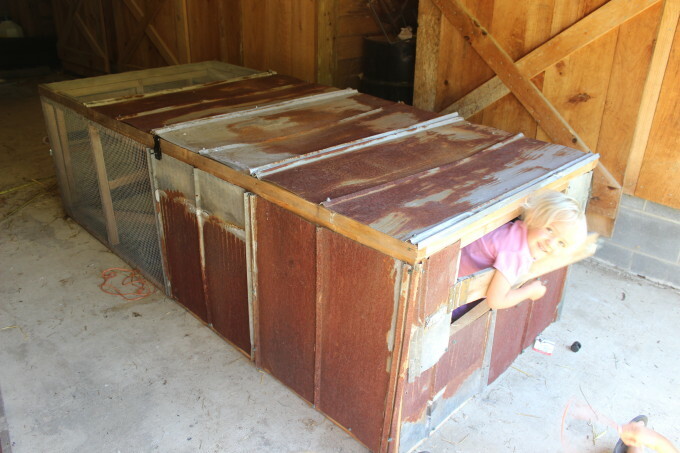 Remove a chicken coop floor (and make it mobile) and you’ve got an eco-friendly “tractor” that doesn’t run on gasoline, AND produces delicious eggs and meat. 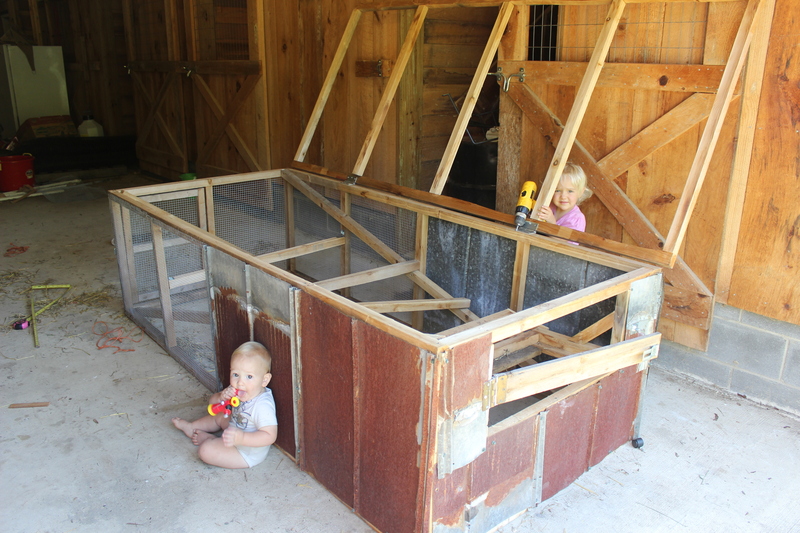 A well-designed chicken tractor is something you can easily build yourself (without breaking the budget). It’s attractive, mobile, hard working, and multi-functional (it tills, fertilizes, disposes of garbage, and/or builds soil). This chicken tractor is perfect for small flocks (12 or fewer) who need to move around on grass or to small garden jobs. Good design, although it looks easy, is very hard to come by. 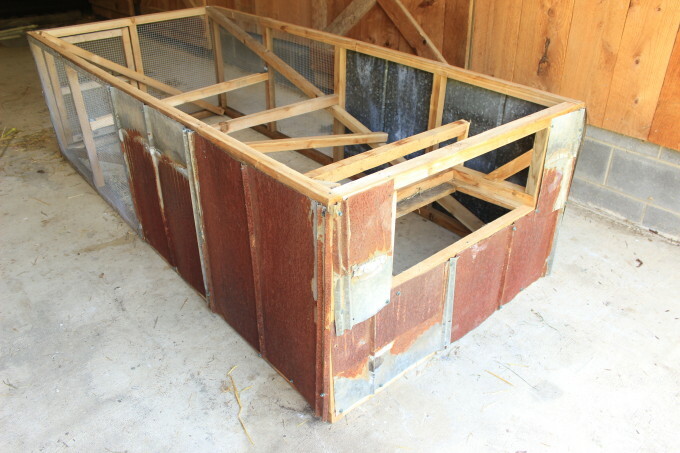 After 10 years of working with chickens, I’ve come up with an easy (and affordable) chicken tractor plan that almost anyone can build. Now, for the first time ever, I’m giving those step-by-step plans (with photos) away for free. 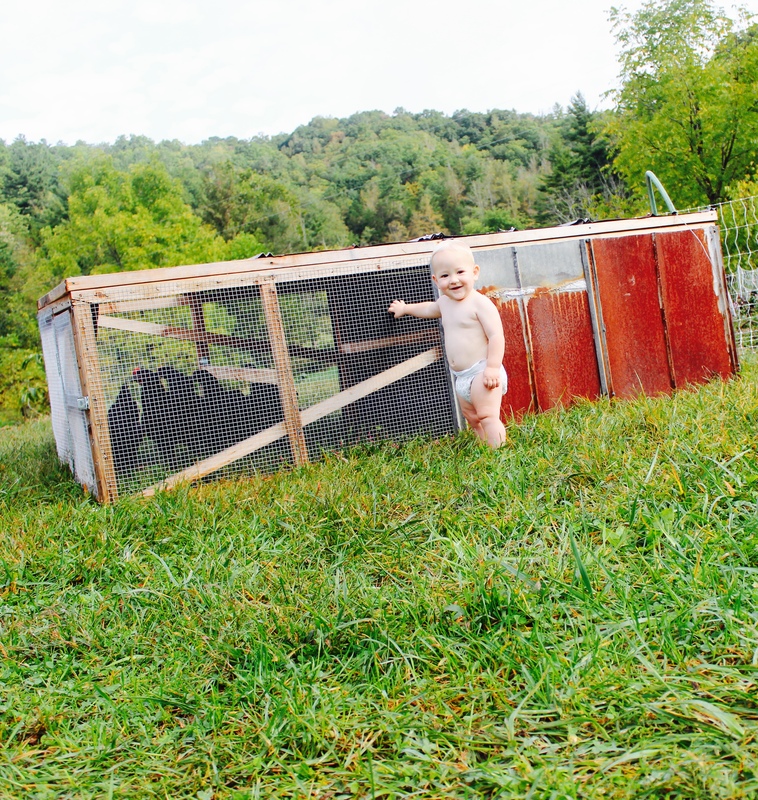 Download my FREE chicken tractor plans HERE! 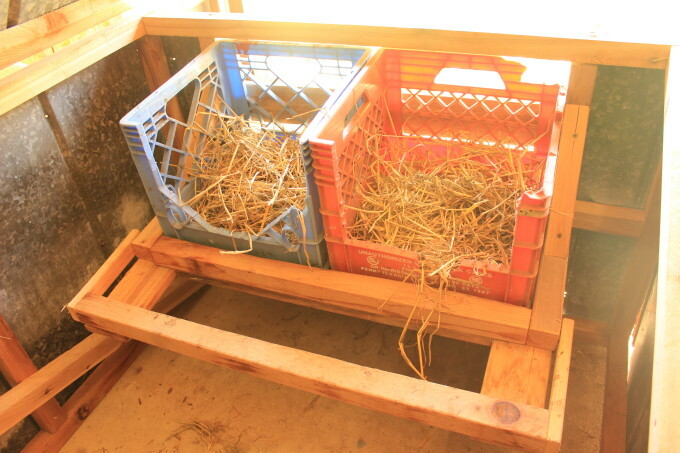 Swiveling landing bar doubles as a nest block to prevent your chickens from roosting in the boxes (and pooping in them). 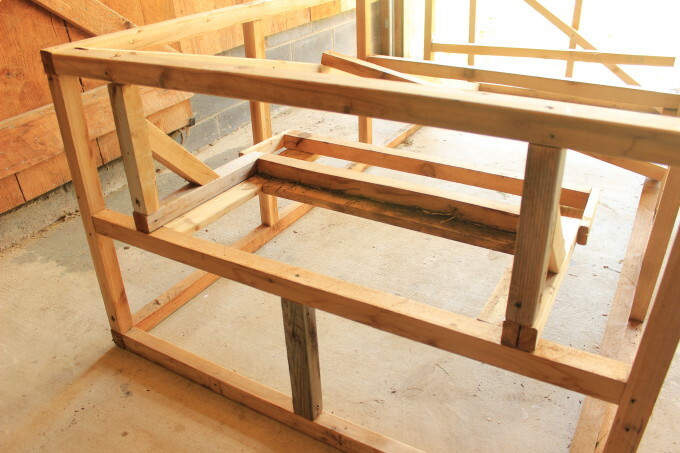 10 untreated 2X4X8s – I like cedar, as it’s naturally rot resistant, but you could certainly use an eco-friendly, non-toxic coat of paint over some untreated lumber. There will be plenty of ventilation, so you won’t have to worry about it creating any respiratory problems. 10, Cedar 2X4’s are currently $8.08 at Lowes. 10, non pressure treated 2X4’s are $2.62 at Lowes. 16 feet of ½” hardware cloth, 24” wide. 4 sheets of ribbed steel roofing (aka classic tin roofing), 8’ long, or at least 25’ of tin. I sourced mine from an old barn roof we replaced. Use the “classic” width of 2.16” wide. 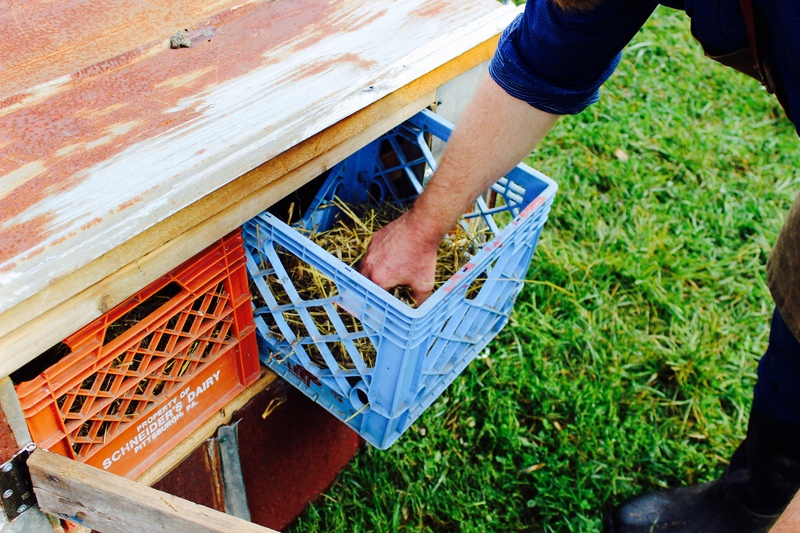 2 milk crates for the nesting boxes. 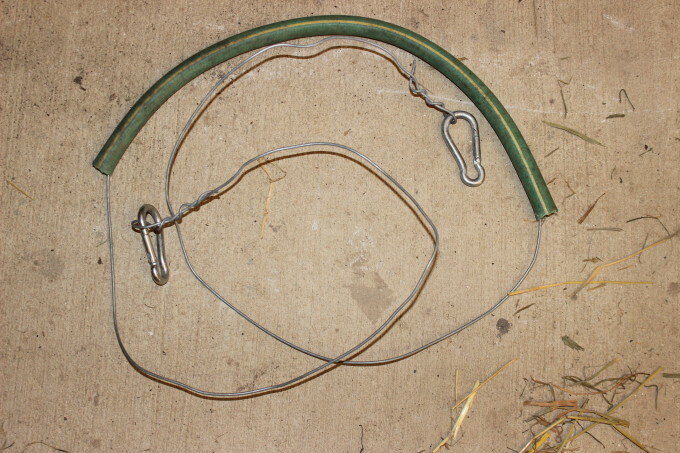 2’ of old water hose to use as a pulling handle over the wire. 2, 2-¾” spring link (aka, hardware carabiners) for attaching the wire to the tractor. 3 hasps for the two doors and lid. A box of ¾” poultry nails for nailing in the hardware cloth. 5, 3½” hinges for the doors and lid. 4, 3-⅞” Screw Eye Hooks for attaching your wire and pulling the tractor. 2’ of 1½” PVC pipe for the bottom skids (optional). These make moving the tractor a little easier and they help to keep the wood off of the ground which (slows rotting). Cordless drill with drill bits — a 5/32 drill bit and a ⅜ drill bit for pilot holes (for the screws and the screw eye hooks). Socket wrench or heavy duty screw driver for screwing in the screw eye hooks. Rip-cut all your 2X4’s. If you’re saying, “Huh”, let me explain. Essentially, this is sawing your board parallel to the grain (long ways). So, you’re really just creating 20 2X2s. Set aside 8 of these “2X2s” to be used as they are. Cut one 2X2X8 into two 40” pieces and one 11” piece (scrap the 5” leftover). Cut one 2X2X8 into two 40” pieces and one 15” piece (scrap the 1” leftover). 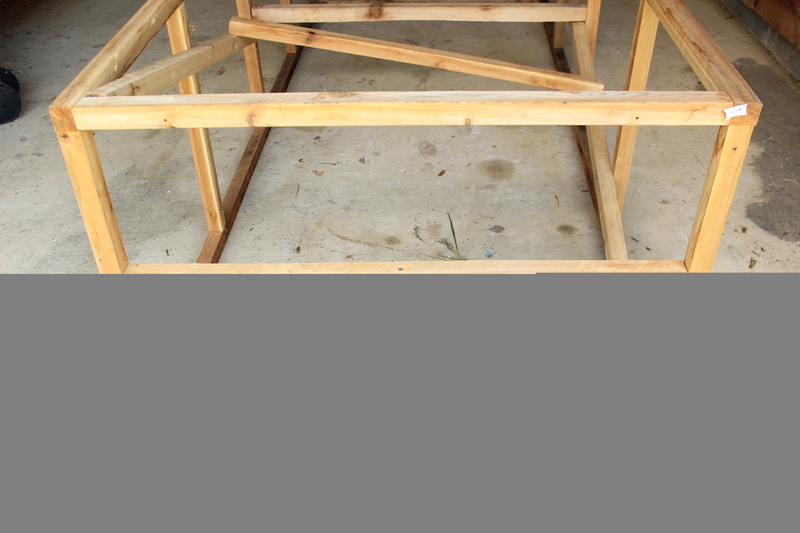 Cut one 2X2X8 into a 47½” piece and two 24” pieces (scrap the remaining little bit). Cut one 2X2X8 into two 40” pieces, and one 15” piece (scrap the remainder). Cut another 2X2X8 into two, 40” pieces and one 15” piece (scrap the rest). Cut one 2X2X8 into a 24” piece, a 30” piece, and a 40” piece (scap the leftovers). Cut one 2X2X8 into a 26½” piece, two 23” pieces, and two 10” pieces (scrap the rest). Cut one 2X2X8 into two 40” pieces and one 15” piece (scrap the inch left over). Cut one 2X2X8 into two 9¾” pieces. Save the 76.5” left over piece just in case you make a mistake and need it to replace something. Save the remaining 2X2X8 to make up for mistakes, or to use on another project. Cut your 1X4 into two 20” pieces, a 23” piece and a 26⅝” piece (scrap the left overs). Cut two 8” pieces from a 1X2 piece of wood. Cut another piece of hardware cloth at 43½” (24”X43½”). Cut two 13” pieces of tin, and take one of those pieces and narrow it to 19”, making sure you leave the rib. Now you have a 13”X19” piece of tin. Cut two 14½” pieces of tin then narrow each them to just 7½” wide. Be sure to leave a rib in each piece. Cut three 43½” pieces of tin. Cut your 2’ piece of PVC in half to make two 1’ pieces of PVC piping. We’re going to rip those later, or you can do it now. It’s just that I have a nice picture in the instructions showing how in the world I ripped these things. You ready for this? Ok, good. Let’s start by laying out two 8’-long pieces of 2X2 parallel with each other, about 40” apart. Now, screw in two of your 40” pieces on either end of your 8’ pieces. Make sure you’re placing the 40” pieces on the “inside” if you know what I mean. In other words, I don’t want your frame to be longer than 8’. So don’t mount your 40” crossbars to the outside of your 8’ pieces. Just take a really good look at one of the picture below. 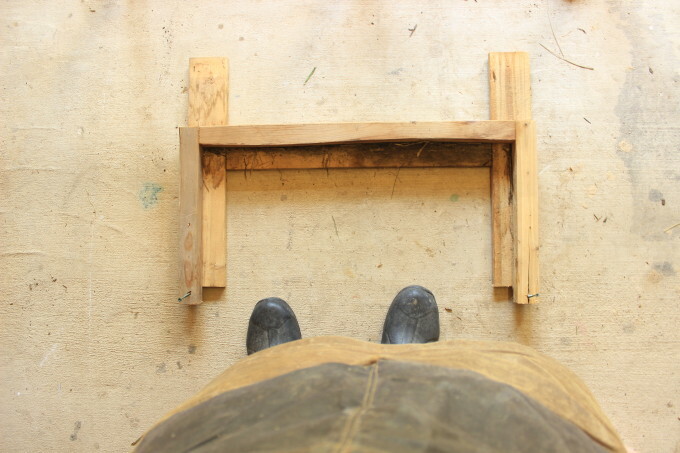 Repeat steps one and two to make another rectangle frame. This next part takes a bit of finess. Go around and screw in your four 24” posts, like like you’re creating a table. Now put in your side vertical posts every 24” from the very end. That’s 3 vertical posts on either side (24” apart). Be sure to put your posts on the center of 24”. Notice there’s not a vertical post in the middle on the “back” wall. From now on, I’ll refer to the end furthest away (in the picture) as the back wall. That’s the wall that will eventually hold the nesting boxes. Hang on, we’ll get to that in a minute. You should now have a ridiculously loose table looking frame. Good job. Now, let’s do the front/middle/vertical 2X2 post. Wow, that was descriptive. By the way, I’m referring to the “front” as the side facing the right in the picture below. The front will eventually have the door. This vertical post needs to be centered at 21½” from the outer edge of both sides. I’m sure there are several ways you could attach the bottom, but I recommend flipping this over and placing your other frame on top. Screw your other rectangle frame onto your posts. If you don’t have a “other” rectangle frame then you missed the part where I said make two of these things in step number one. 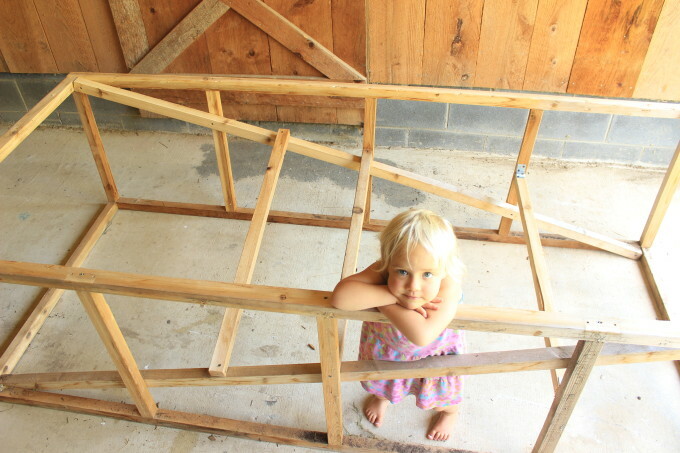 No big deal, just review step one to make another rectangle frame out of 2, 8’ 2X2’ and 2, 40” 2X2’s. Be sure to screw in at the same measurements (for example, every two feet for the side posts) as this will ensure your posts are actually straight up and down. Take two of your eight footers (2X2s) and use them as diagonal bracing along both sides (on the inside of the frame). Ok, how do I say this next part? Make sure the braces don’t run in the same direction. Notice how the one furthest away slopes down to the right and the closer one slopes down to the left. Do that. Why? Because I said so. No really, it’s one way I figured where we could mount three perches in keeping with certain rules. You’ll seen in a minute. 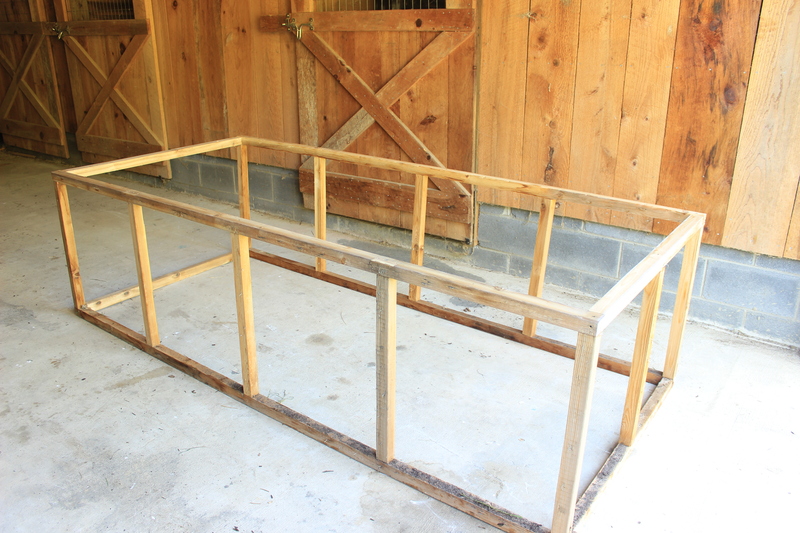 Take your 47½” 2X2 piece and use it as a diagonal brace across the front. Now, make sure you slope it up from left to right. It’s important to keep that right side “open” for the placement of our door later on. Let’s start with the middle perch (it’s the easiest). Grab a 40” 2X2 and place it across the middle. Notice how it “rests” on the middle of both cross braces. Nice! Screw it in. Now, let’s add the perch that’s on the right. It’s also 40”, 2X2. Be sure to mount it a foot up. 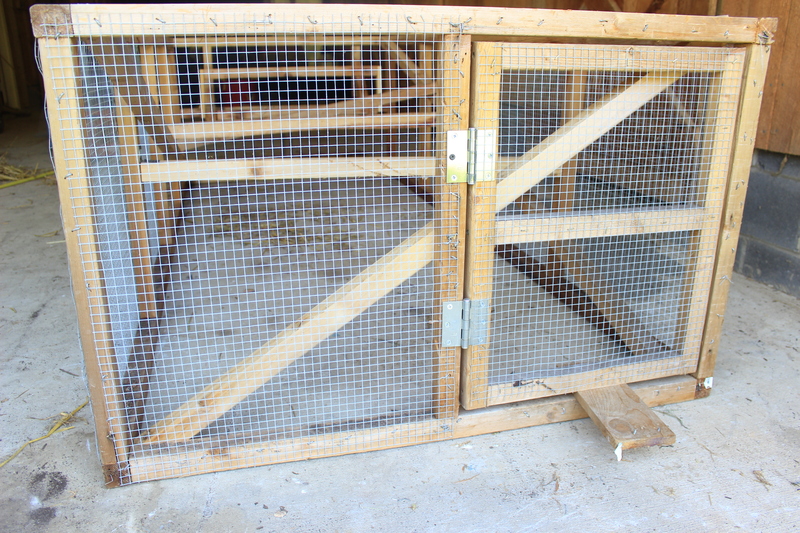 You might notice that I’ve taken care to make sure the chickens have at least a foot above the perches (so they can be on them) and a foot below (so they can roam underneath them). There’s one more thing about the perch on the right. Look closely, and notice I used an angle brace. I must have been day dreaming, cuz you can totally drill through that vertical post into the perch. Do that. Forget the angle brace. The left perch. You can’t tell from here, but it not level. In nature, chickens would perch on a branch. When was the last time you saw a straight branch? Oh, I know what you’re saying, “but aren’t branches round?”. 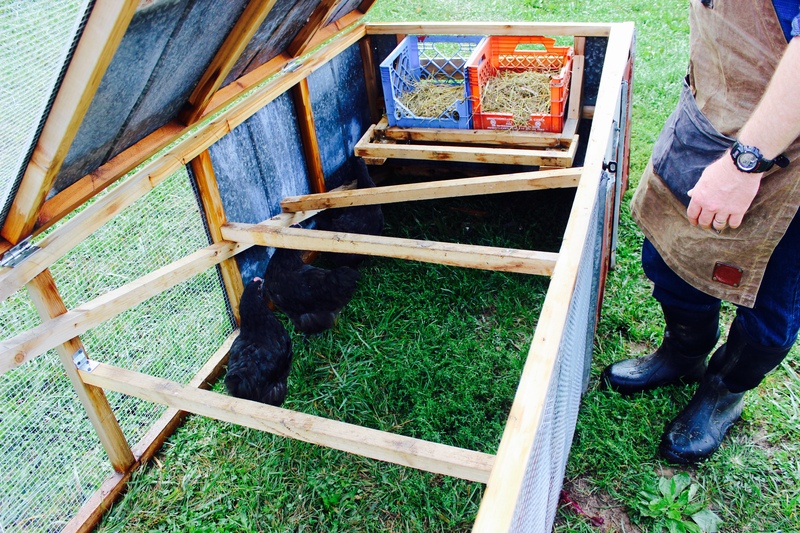 My chickens don’t seem to mind the square perches, and it makes for an economical solution. If you’re really concerned, you could totally sub these out for round perches. Ok, seriously, we’ll get back to building. It’s important that the perch on the left NOT go any further to the left. That’s because we’ll need to leave room for our future nesting box contraption. To know where to place this left perch, measure out one foot to the left of the middle post. 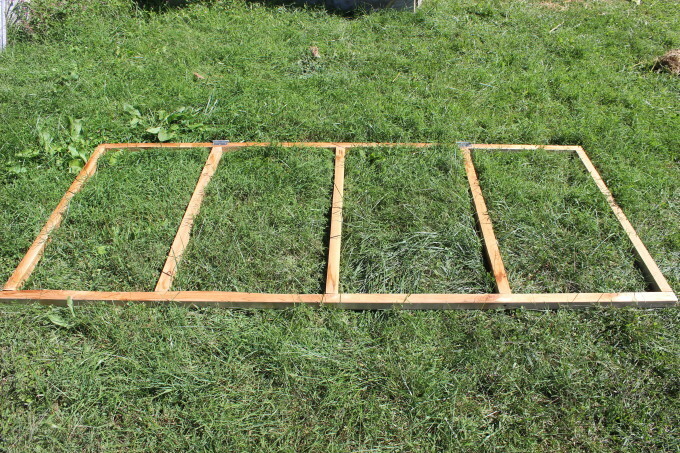 For the “back” side, run a 40” 2X2 across the back, placing it 11” up from the top of the base frame. If I were you, I would take one of your 11” 2X2s and rest your cross piece on that. Then you don’t have to measure anything. Now, screw in an 11” 2X2 in the center (that’s 21½” from either side). Let’s first build the 2X2 framing. Screw in two 15” 2X2s onto the end of the 26½” 2X2. See the photo below. 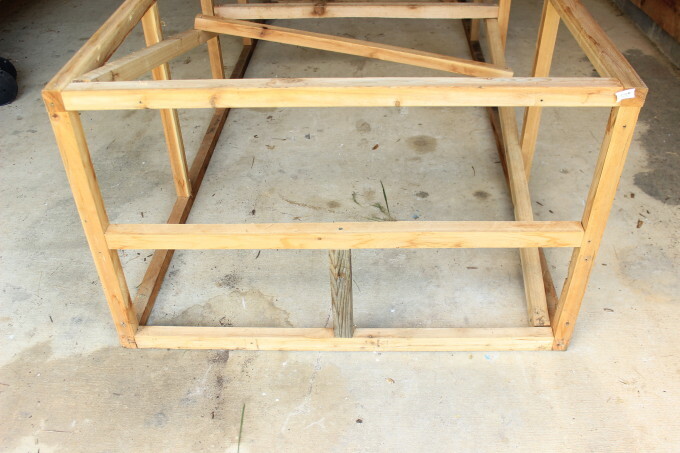 Now, let’s put our 1X4 “bottoms” onto this framing. I like to put these together by screwing in the 1X4’s on top of the framing, then flipping it over when it’s done. That way I can use smaller screws by screwing through the 1X4. So, go ahead and loosely place your two 1X4X20” pieces on either side and your cross 1X4X23” cross board on the frame. Now, place your 1X4 cross board in the middle running between your two side 1X4s and screw into the 2X2 frame. 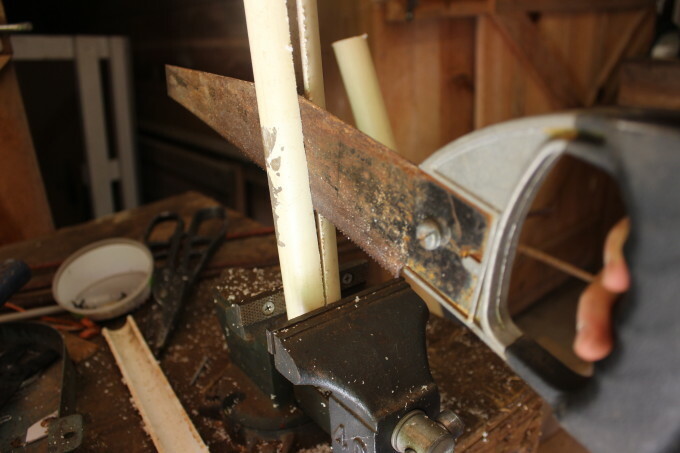 Make sure you’re placing the 1X4 cross piece flush to the outer edge of the 2X2 cross piece. Now, flip this contraption over. Does it look like the picture below? Good. Let’s move on. Oh.. you need a break? My dad used to say, “we’ll break when it’s over”. No seriously, if you’re not having any fun, take a moment for some tea. Re-group. Ok, welcome back. Let’s finish this thing! Let’s put together the swiveling landing bar. Screw in the two 1X2X8s into the ends of your 30” 2X2 and you’ve got a the swivel bar. Notice how I put two screws in on either side. That keeps the 2X2 cross piece from twisting. Mount the swivel bar by setting it on you nesting box base. Screw only one screw into either side and make sure you don’t screw it in tight. You want it to be loose so that you can use these screws for “axles” to swivel on. Go ahead and rest your nesting box in the center (just estimate the center at this point). 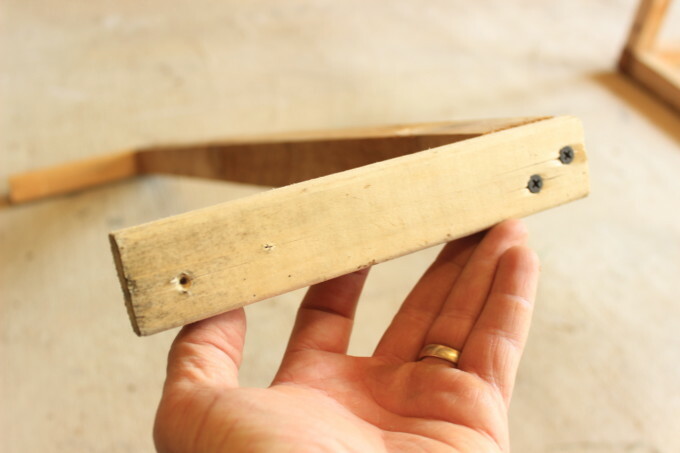 Use a scrap piece of wood or a partner to hold up the other end of the nesting box base while you work on attaching it to the frame. To center this thing, measure 5” from the inside of the corner posts. Screw in you two vertical 2X2X9¾” posts on top of the arms of the nesting box base. Take your two 10” pieces and cut 45 degree angles on both ends. Go ahead and screw in your 10” diagonal braces. This will go a long way for holding up the nesting box base. Hammer in your four 24” pieces of hardware cloth into the front sides of your chicken tractor. 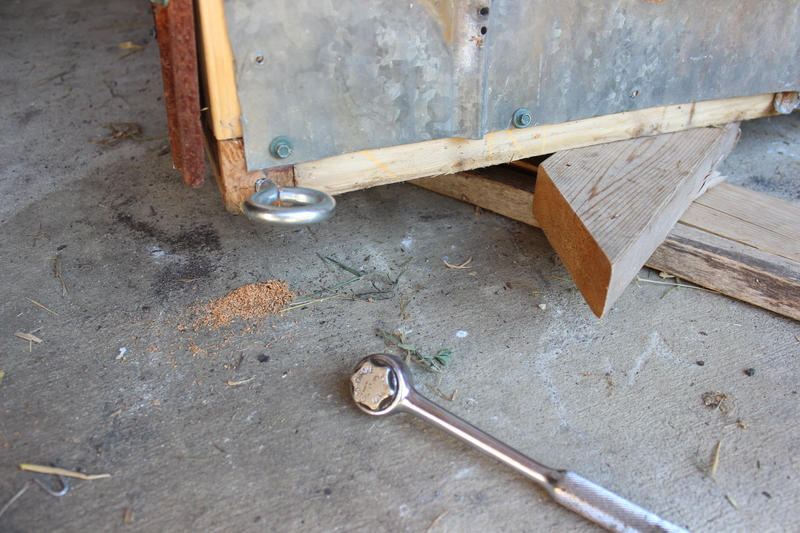 Hammer in your 21”X26” piece of hardware cloth onto the front left “panel” of your chicken tractor. Make sure you’re mounting this on the left side of the front. That’s important because we’ll need that right side to serve as our door. First, lay out two 23” 2X2s parallel with each other about 15” apart. Then, I like to attach my two 3½” hinges. I mounted one in the middle of the upper half, and the other in the middle of the lower half. Make sense? Check out the photo below. Pat yourself on the back; you’re on your way to making this tractor very multi-functional. 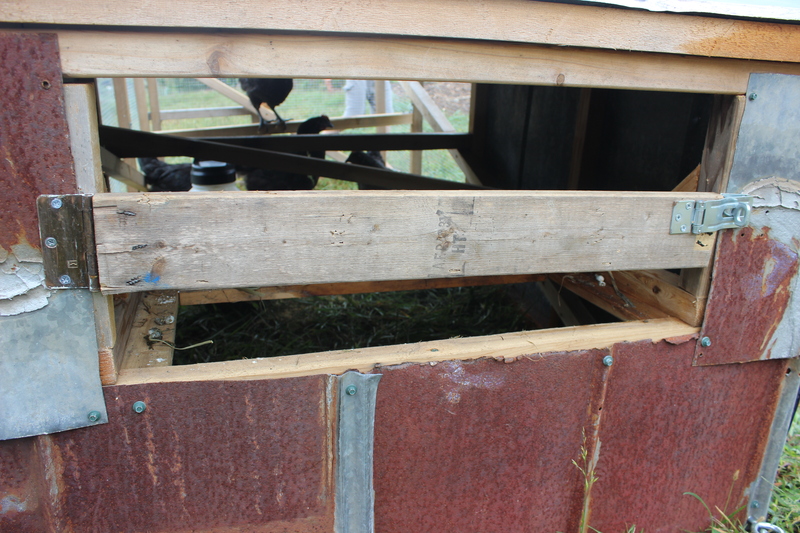 You could use it as a tractor (of course) but now you could use it as a small coop (letting them out during the day). Check it out — I’ll save you a lot of hassle installing this door. Do you see that scrap 1X4 jammed in below the door? Ok, that’s holding your door perfectly in place (until you attach it). You can use anything that’s ¾” thick (yes a 1X4 is not really a 1X4, but a ¾”X3½”). Also notice how I didn’t set the door flush to either side (it needs room, folks). 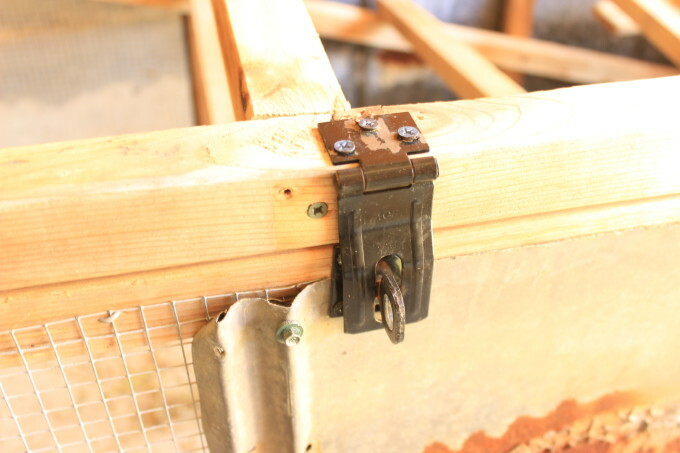 Just mount your hinges so that the little round “hingy” part (oh my, what would you call that) is out over either of your edges (door post and door frame). Take a look at the photo below and notice how the “hingy” part is in the middle of the crack. Go ahead and put your side panels on. By panels, I mean those used or new tins you’ve rounded up. Grab your four 26”-long pieces of tin and screw them into the back two quarters on either side. Be sure to use your tin screws with rubber washers. The back paneling is a little tricky, but we can do this, I’m sure. Let’s start with the bottom two panels. Start by placing your 13” tall piece of tin on the lower right side. Screw in a couple of screws into the right post and then the middle post. Now cut a 13” X 19” piece and make sure you still have one of those “vertical” ribs. Place that 13” X 19” piece on to the bottom left corner. Make sure you put your ribs together. The ribs won’t line up over a post, but they provide enough strength to be stable. Just screw in the corners, bottom, and top of the tin into your frame. Take your two 7½” X 14½” pieces and attach them to either side. Make sure you run ribs along the outer edges. Notice how I have a bit of overhang over the bottom. 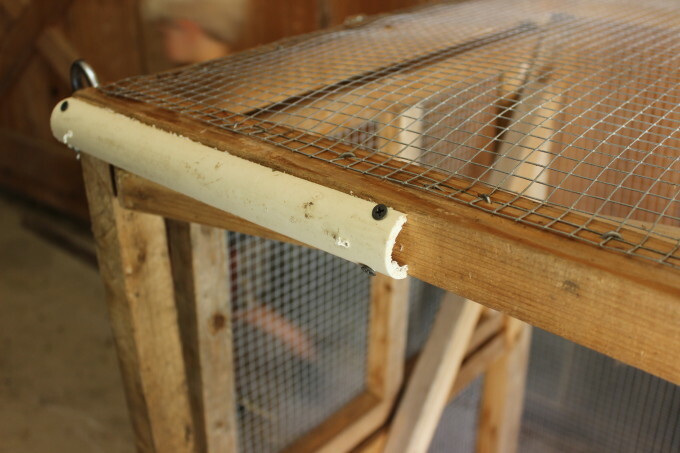 That’s a good thing, as it helps keep the water runoff out of the coop. I changed a few things about this feature since the time I took the photos of the build. So, I had to go out into the yard and get this shot. I pulled out the nesting boxes for the photo (you’ll add those later in the process). Hey look, there are some “teenagers” as I like to call them (young birds, 3-9 months old). It’s light at the end of the tunnel! Can’t you just envision your birds in there have a grand ol’ time? Attach a 3½” hinge to your 26⅝” 1X4. Now, attach the hinged 1X4 to the left side. Notice how the “hingy” round part doesn’t hang out over the edge, but just barely touches it. Notice also how the “hingy” round part sits so the round part is facing out. Do that. If you’re doing this right, the 1X4 shouldn’t be touching the right side of the frame. You can now easily attach your 3½” hasp. I’d start by attaching the lock part first. Then place the hasp on that lock and then you can easily see exactly where to attach the hasp. Lay out two 8’ 2X2s about 40” apart. Now grab five 40” 2X2s and attach them at the ends every 24”. Make sure you attach them on the center of the 24” on either side. Oh, and I like to put two screws in on either side of each 40” piece. That way, there’s no twisting. 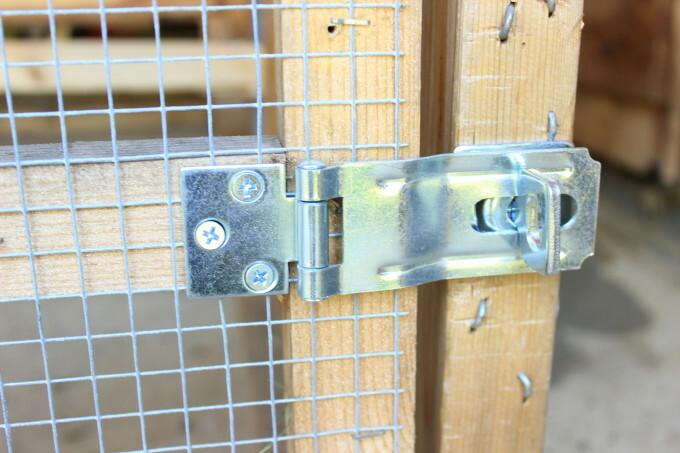 Get two 3½” hinges and attach them to your frame around the two-foot marks from either end. Yep, around where you have your 40” cross pieces. Look closely at the pic and you can see where I mounted my hinges. So, I sat the tractor near a wall to help stabilize the roofing frame while I attached it. You could also hold it up with one hand and drill with the other. It’s tricky, no lie… and works better with a friend. Just “gird up your loins” and attach the thing. 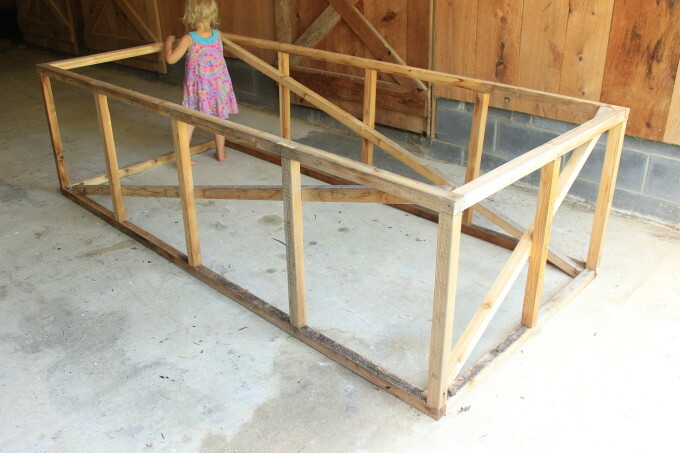 Oh, I should tell you… place the roofing frame on the tractor frame first. That way you can adjust to get it perfectly on top (no overhangs/underhangs). 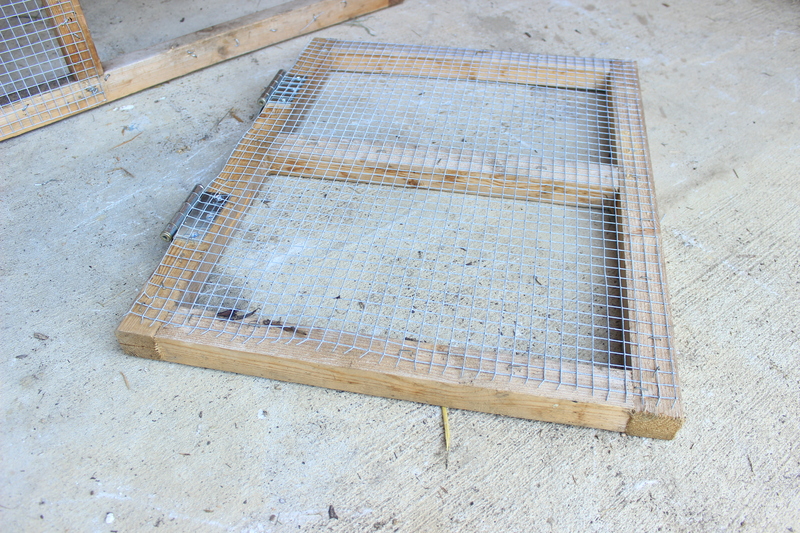 Then you lift up the side without the hinges and screw in the other side (that does have hinges, obviously). Notice we’re putting this on BEFORE we put on our roofing. It’s a lot easier to attach that way and looks much better too. Also, notice how my hatch sits a little off-center. That’s to avoid having to mount the lock end of the hatch to the ridge of the tin. It’s not big deal to be a little off-center and it makes it so much easier just to attach it a little to the right of center (or left). Take your three 43½” pieces of tin and put them on the three open quadrants of your roof. They should lay over each other nicely. Attach them with your roofing screws. Prop up an end of the tractor for easier access to the bottom frame. Drill a ⅜” pilot hole on either side of the tractor to prep for the “O” ring. Now, screw in your eye hook screws then repeat these three steps on the other side. Oh… I used that socket wrench to screw in the “O” ring. It helped a lot but you could use a screw drive, stick, pipe or something similar. 57. Get your cord, wire, rope or whatever, and slip the two feet of gardening hose into the middle of it. Now, make loops in either end. I used thick electric fence wire (12-14 gage) and was able to twist some loops in the end somewhat easily. Twist or tie some loops in each end and attach your carabiners. Take your plastic milk crates and saw an opening in the front of each box. Keep an inch or two of wall space on the sides and 3 to 4 inches on the bottom walls. My boxes were super beat up (and that’s ok), but I think you’ll get the point from the picture. Place the milk crate nesting boxes in the nesting platform and voila, you’ve got a nesting area that cleans itself! I put on several feet of PVC runners as skids to make moving the chickens tractor a little easier and to lift it up a bit to keep it off the ground (less rot). Take the two feet of 1½” PVC and saw it in half. Now, split each piece down the middle. I did this by putting it in a vice and sawing it through. Screw in your four runners (round side facing out) along all four corners. Make sure to mount them on the ends of your 8’ 2X2s that are on the bottom of your tractor. I flipped the chicken tractor on its side for access. Make sure to screw diagonally through the side of the runners. That way your screw heads aren’t sticking out the bottom, catching the ground. I used a 5/32” bit to drill a pilot hole for each screw, making it so much easier. Ok, it’s time for its maiden voyage! Drag the tractor (or find a friend to help you carry it) to its spot in your yard or homestead. Move frequently (unless you’re tilling the area underneath). Moving every day is ideal. If you’re not tilling, then by all means, use the door to freerange 100% or use as a coop inside of an electric net fence. Download the printable plans HERE. It’s FREE! 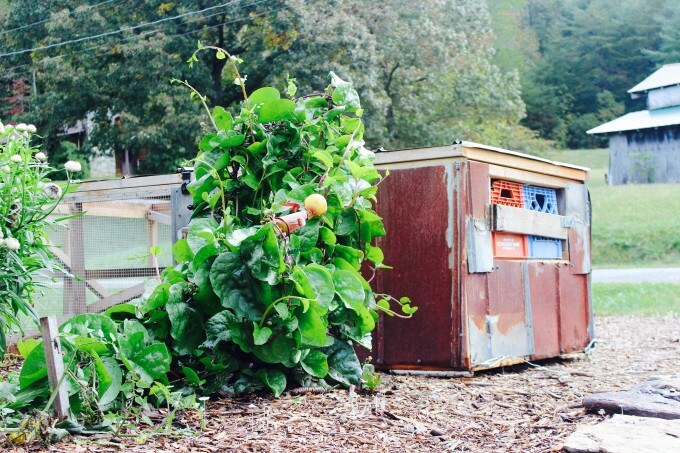 Build this chicken tractor, and you’ll be well on your way to a more fulfilling and sustainable lifestyle. Chickens are priceless assets to any yard or homestead, and this chicken tractor helps take advantage of their powerful characteristics. 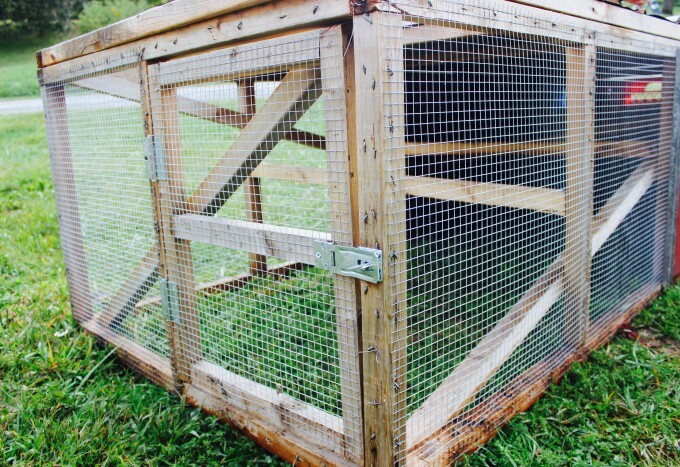 Now, you can easily house a small flock in an easy and affordable way.